Foam rolling is the new and upcoming term in health and fitness. It seems that everyone is now doing it. Foam rollers are exercise and massage tools that enable you to massage and release tight, sore trigger points. This practice is known as “myofascial release,” and “foam rolling” with a foam roller allows you to do it at home instead of working with a physical therapist or fitness coach. In this article, we’ll look at how foam rollers work, the benefits you can get from using one, and the best foam rollers to choose from. Foam rollers are cylinder-shaped rolling tools that come in different sizes, shapes and textures. They also come in different degrees of firmness that can change the intensity of the massage they offer. By breaking up muscle knots, they relieve tension and provide benefits that extend to the entirety of your body. In addition to using foam rollers to practice self-massage techniques, you can also use them for exercise, as they’re sometimes used in pilates, yoga and other exercise programs. The most simple way to describe what foam rolling is, is to compare it to massage. It is a form of self-massage. Rather than it being a massage where someone else’s hands are doing the work, in our case, it is we who are applying the movement and the foam roller is applying the pressure. Foam rollers work by using your own body weight to compress your muscles onto the roller, which you can roll over the muscle in a self-controlled way. This compression causes muscles to relax and loosen just like they would from a massage. However, foam rollers have the special ability to loosen and tone the fascia, which is the soft connective tissue around your muscles. When you apply pressure onto the foam roller, the foam roller acts to loosen up the fascia of the muscles. This fascia can become tight through inactivity or after exercising and if not loosened out can cause the feeling of tightness in the body as well as many other problems. Foam rolling is called “myofascial release” because it allows the fascia to release and act as a lubricant for muscles that are “hugging” onto bone too tightly. In addition to reducing tension, this also increases blood flow and nutrient circulation in the muscles, which promotes faster healing. There are various massage techniques using foam rollers that allow you to release different “trigger points” that hold tension. Popular techniques allow you to relax your calves, hamstrings, quadriceps and glutes. The massage is performed on the floor using a mat, with the roller between your leg and the floor. By moving your body, you can roll the foam roller along the floor to massage one isolated muscle at a time. Although foam rolling seems so simple, there are many benefits from massaging the fascia or performing myofascial release. Foam rollers used to be reserved for athletes and physical therapy patients. However, compounding evidence touting their benefits has shown how helpful they can be for everyone else. Whether you want to massage tight muscles, speed up recovery after exercise or alleviate pain, there are several health benefits foam rolling can offer you. Foam rolling boosts the flow of blood in the muscles you use it on, which in turn increases circulation throughout your body. The compression of your muscles and connective tissue with a foam roller forces blood to leave the muscle and be replaced by a fresh supply of blood. When microcirculation within muscles is impaired due to tightness, oxygen and nutrients like glycogen become depleted in the muscles. With more blood flow, muscles can function better and heal faster. It can relieve muscle pain and reduce the risk of injury. You can customize your massage and control the areas you want to focus on based on the feelings you get as you use your foam roller. This allows you to use your own sensations as a feedback mechanism for massage, rather than relying on someone to massage you. By focusing on areas with tenderness or pain, you can get more out of your massage. Myofascial release has been proven to reduce recovery time between workouts, especially when used right after completing a workout. During exercise, lactic acid builds up within muscle tissue. Foam rolling helps your muscles flush it out by putting compression on them and drawing fresh blood into your fatigued muscles. By helping your muscles get rid of lactic acid and get the nutrients they need to recover, foam rolling allows them to rebuild faster. Lactic acid build-up in muscles is what causes delayed-onset muscle soreness (DOMS), which is a common complaint after a hard workout. Foam rolling is shown to improve pain and tenderness caused by DOMS when performed after exercise. By loosening tight muscles, foam rolling increases muscle flexibility. By releasing the fascia (connective tissue around muscles), it lubricates the muscles so that they can separate from the bone and be used in their entirety without friction. Better range of motion translates to better athletic performance and a smaller chance of pain or injury after a workout. If you’re trying to lose weight or build muscle mass quickly, you can do it faster with myofascial release in between training sessions. By boosting blood flow in your muscles, foam rolling helps them stay better hydrated, oxygenated and energized during exercise. Looser muscles are able to move faster with less friction. This gives you faster, smoother movements during exercise and reduces the risk of injury. Foam rolling releases inflammation around the bone, which helps relieve pain. If you’re an athlete, you may be familiar with shin splints, IT band pain in your knee and pain in your Achilles tendon. Foam rolling can help with these leg pains, which in turn saves your back from potential pain because it doesn’t have to compensate for sore legs when you move. If you spend a lot of time sitting at a computer desk and experience upper or lower back pain, foam rolling can help reduce the inflammation and help your tissues heal. There are a number of things you’ll want to look for when choosing a foam roller. The denser the foam roller the more relief you’ll get. Beginners will most likely want something that is dense but still has some softness to it. A standard foam roller with a medium density should be fine for starting out. However, the more your body gets used to rolling, the higher the density you’ll need. You’ll notice some foam rollers have patterns and protrusions on their surfaces. These are designed to ‘dig’ into the knots more than a flat surface would in order to trigger a deeper tissue massage. For most of us, these aren’t necessary and a flat surfaced foam roller will do. If need be you can always use massage balls to get a deeper massage if required. Foam rollers come in different lengths. A longer foam roller is easier to stay on than a smaller one, however, the standard size should suit most people. Another point to consider is that a smaller foam roller is easier to carry around than a longer one if you wish to take it with you when travelling. Your foam roller will have to be strong and durable since it will have to support your full body weight for long periods of time. It should also be something that doesn’t break easily and will last you a long time. In most cases, you’re likely to go through a few different foam rollers in your life as your needs change. If you have muscle tightness or pain, or if you’re looking for better recovery time between workouts, trying out a foam roller is well worth the investment. Before you do so, you’ll want to take a look at the best foam rollers on the market today. This section covers the best foam rollers to choose from depending on your needs. It’s a simple moulded polypropylene roller with a slightly grippy surface which is good to avoid slipping. It has a rough surface that prevents slipping so that you have adequate control over its rolling while you use it. Available at 36 inches it’s also quite long which makes it easy to stay on. The foam rollers created by AmazonBasics come in different lengths, including a 3-foot long roller longer than most foam rollers on the market. This allows you to do more movements with the roller and target more muscle groups at a time when you align your back along its length. It isn’t as high quality as some of the other foam rollers on this list, however, it is good value for money. Although it is quite dense, people who have rolled before may want something more firm. If you want to experiment with foam rolling this could be a good starter option due to its price. However, this foam roller may not be for beginners. It’s better left for people who can handle its intensity, as it has a high density that compresses your muscles very firmly. On the other hand, it provides a deeper massage for people who can withstand it. Ultimately, this is a good option for intermediate level users. The OPTP Pro Roller is made with durable material, but there are other products out there with similar quality for a lower price. While it’s priced higher than its competitors, it’s guaranteed to last a long time without flattening. 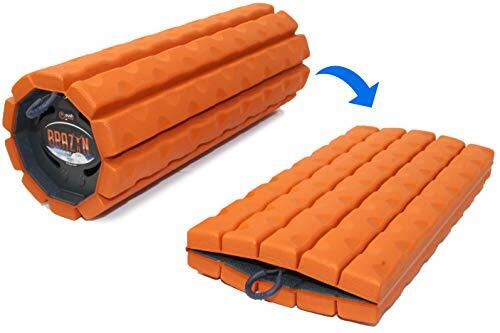 While its density is high enough to do its job and loosen tight muscles, it’s a lot softer than the AmazonBasics foam roller. The OPTP Pro-Roller is a better option if you need a lower intensity level. This is a great option for beginners. This foam roller isn’t as pricey as the OPTP Pro-Roller, but it’s more costly than most of its competitors. On the other hand, if you’re looking for an intense deep tissue massage, its unique texture could make it worth the price. Its multi-density exterior is designed with ridges that help you hit trigger points as if you’re being massaged by hand. If you need a high-intensity deep tissue massage and its patented design works well for you, you may not find anything else like it. However, it’s harder and more painful than some rollers because of its therapeutic-grade intensity. This foam roller is an intermediate level foam roller in terms of density. It should be dense enough to release most muscles. It’s also extremely durable and is unlikely to break or become unusable in the future like many other rollers. 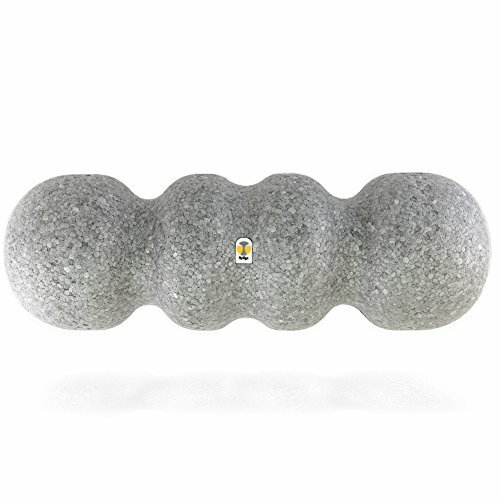 Like the TriggerPoint GRID foam roller, the Rumble Roller has a unique, patented exterior designed for deep tissue massage. It provides deep tissue work and point-of-pain therapy, and you can work at the intensity level you feel comfortable with by choosing from different models with varying degrees of firmness. In addition to using it for myofascial rolling exercises, you can also use it very effectively for sustained trigger-point work, which means you hold a position that compresses it to your muscle rather than rolling it. It comes at a steep price compared to most foam rollers, but if its therapeutic design works well for you then it could be worth the investment. The Rumble Roller has extra bumps and ridges to dig deep into sore and tight muscles. This kind of roller will provide much more relief than flat surfaced rollers, however, the experience will be much more intense (at least in the beginning). It is available in different lengths (12, 22 and 31 inches) and also has two options of density, Original and Extra Firm. Beginners may want to stay away from this model until they have loosened up most muscles. If you are interested in this roller you can read our full Rumble Roller review. 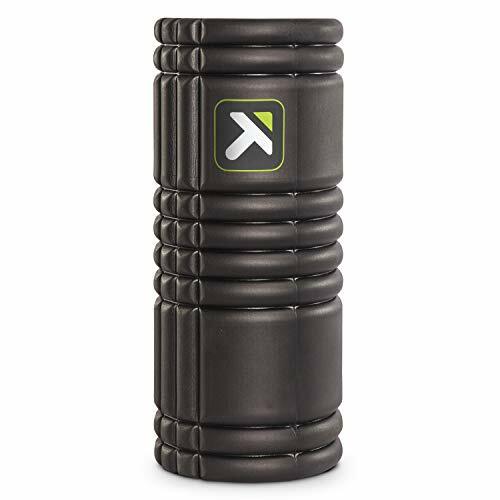 The Brazyn Morph Trek foam roller is collapsible and convenient for travel, and its firm exterior is designed with steep ridges for effective myofascial release. Some users of this product compared it to the TriggerPoint GRID roller based on its professional-grade quality and effectiveness, but with the added bonus of better portability. It comes at a high price, however, as it’s more expensive than the TriggerPoint GRID and many other foam rollers. The Rollga foam roller is shaped with grooves so that it can bypass bones and hit only muscle. This can prove more comfortable if you find other foam rollers too intense and painful on the bone. On the other hand, its material is very firm with little “give” to it. While it may take the pressure off your bones, it still delivers firm pressure to hard-to-reach fascia and muscles around them. The Rollga comes with a carry strap you can use for bringing it to the gym or anywhere else you may need it. The next stage up from having a foam roller with very deep ridges is to add on vibration functionality. The added vibration seeks to bring even more muscle relief over a traditional roller. 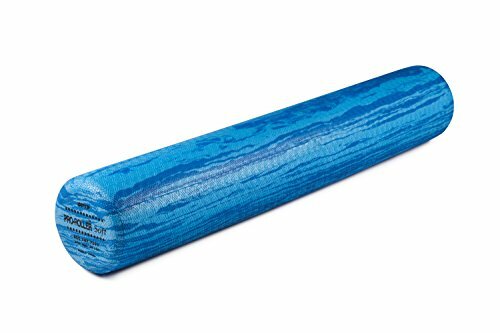 This foam roller is best for someone who has been foam rolling for a while. Vibrating foam rollers can help better release tight muscles through the help of quick-moving friction. The Hyperice Typer 2.0 vibrating foam roller has 3 vibration speeds you can use for different intensity levels. It comes with rechargeable batteries that give you up to 2 hours of use at a time. While its marketing claims state it’s the best of its kind, unfortunately, this product has been reported to break easily and have a short lifespan. However, it’s effective in relieving muscle tightness and pain while it lasts. The Phenom 3 speed vibrating foam roller offers similar features as the Hyperice Typer 2.0 roller but has a uniquely textured exterior as opposed to the mostly smooth surface the Hyperice. Also, the Phenom roller is offered at a lower price and can last an hour longer without being charged. Its ridges, contours and grooves are designed to hit trigger points and work as a biometrically aligned tool for myofascial release. It features gel-padded knobs that provide deep tissue massage with just enough cushion. 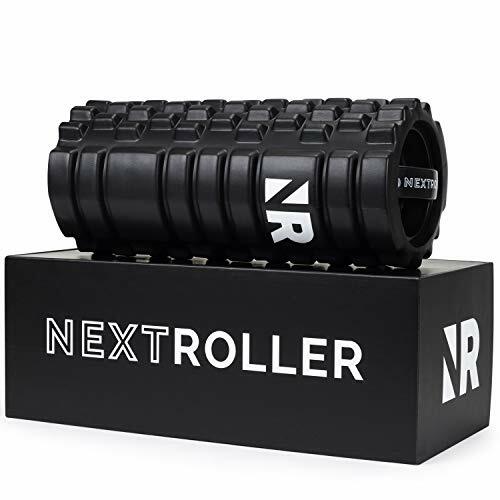 The NextRoller vibrating foam roller is highly comparable to the Phenom roller because it offers vibration with a textured surface for rolling. 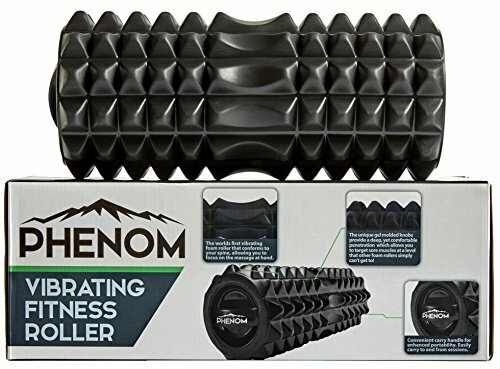 It has knobs for deep tissue massage similar to those on the Phenom, except the Phenom’s knobs are gel-padded, whereas those on the NextRoller are harder. Many users find this too intense, while more experienced users appreciate its effectiveness. The NextRoller less expensive than the Hyperice Typer 2.0 roller and the Phenom roller, while offering the same 3-speed vibration capabilities. 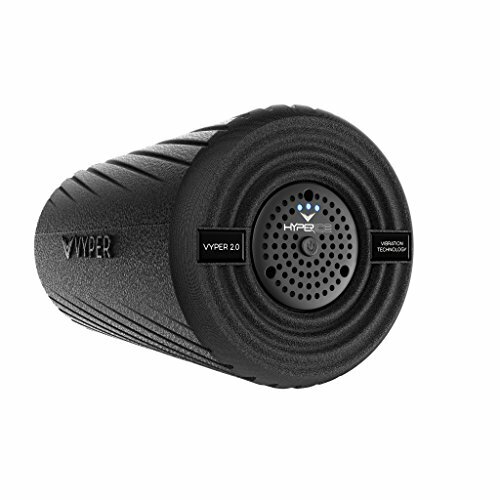 While most vibrating foam rollers offer 3 speeds of vibration to choose from, the Vulken 4 speed roller gives you an extra “auto” setting where the roller pulsates instead of vibrates to help loosen muscles. While this roller costs less than most vibrating foam rollers, unfortunately, it has a weaker vibration than its competitors. 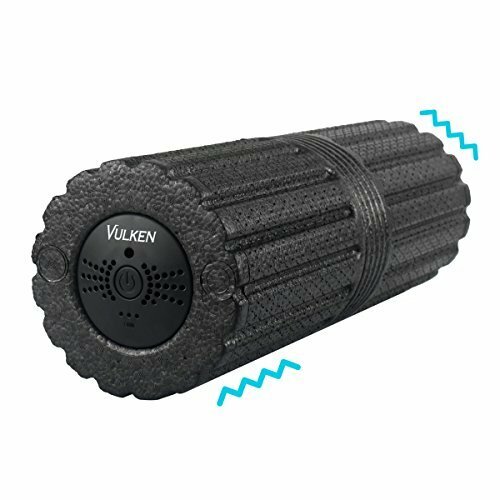 If you’re looking for something softer and less intense than most foam rollers, the Vulken may appeal to you because it has less density, resulting in more “give” and less resistance. On the other hand, if you need something more heavy duty for an intense level of myofascial release, you may not be satisfied with it. A regular sized foam roller isn’t always easy to carry around or pack into your suitcase. In this case, you may want to consider a portable handheld roller. To use one you would hold onto either end of the stick and the middle part acts as the roller. For more information see our list of the best muscle roller sticks. It’s easy to get started with your own deep tissue massage and myofascial relief work when you get a foam roller. Many foam roller companies offer online videos for training on how to use the product effectively. However, it always helps to have a physical therapist or fitness coach who is familiar with foam rollers so that you can get the most out of them. The great thing about foam rollers is just how versatile they are. This video shows a full body foam rolling routine you can do to increase flexibility. When you first start rolling you’ll hit many points which feel extremely tender. The idea is to hold the position and to embrace the discomfort until you feel the pain subside. If the pain doesn’t subside, then hold on for at least 30 seconds. It may be the case that you’re extremely tight in that area and will have to focus on releasing that area for the next couple of days. It may take a few goes before you find the right foam roller. The first foam roller you buy may feel too hard for you, however, over time you’ll discover that it’s in fact too soft! The basic idea for finding the right foam roller is to get a good quality foam roller that suits your basic needs and then supplement your additional needs (deeper trigger points) with massage balls and other myofascial release tools that are specialised for deeper release. If you’ve never foam rolled; start now! It will be uncomfortable in the beginning, and after long sessions of rolling you’ll feel pretty sore, however, over time this soreness will disappear and you’ll start to feel the benefits. Foam rolling is one of those things that once you start it’s unlikely you’ll ever stop. Foam rolling is a great alternative for people who like the idea of going out and getting a massage, but don’t like the ‘other stuff’ that comes with it (such as the cost and someone you don’t know touching you!). Foam rolling can be done at home every day, and it’s quick and easy to do. It is used extensively by physical and massage therapists, as well as personal trainers and athletes. Luckily for us, you don’t need a medical degree to understand how to do it as it’s rather intuitive.